Back when Proving Grounds was released it was great to see updates on the project and how things had been progressing. There was a bit of a community vibe going on the forums. As there have been no Twitter/Facebook posts since June 2016 It seems like everything has just fallen through and we will never see the results from all work the team put in over the years. Looking forward to hearing more soon! Still here too hoping for news. Sol C is still the best multiplayer fun I've ever had, and with a few more maps I'd probably be playing it a lot more. Not sure I should be saying it, but honestly I'm not sure what's been going on either. Sounds like 1/2Hawk and Seb might know something, but they haven't been here for a little while -- I'm gonna try and get in contact and hopefully share what I find. Isthay ignatureshay oesn'tday eallyray aysay anythingyay. AFAIK, development was halted as Seb, metalgunner and Hawk wanted to focus on making it a VR title. But I'm not sure what they are working on if anything, haven't heard from them in a long time. I myself left after we were done releasing PG. It's been a fun ride but I was burnt out by the long development cycle. It was my first complete game and as such left quite a mark on me. I do want them to continue Sol-C, but it's their choice to come here and say something. Thanks for all the hard work you did Max. PG is the best multiplayer experience of any kind I have ever encountered and probably features my favorite flight model of any 6Dof game. I hope whatever you're up to now is going well for you. Thanks Yoshi. I did talk to Seb briefly the other day and he said he might pop in and say something. Not sure when that will happen though. What the heck is going on with this project? Is it dead? It sure looks that way. Its Talon all over again. The responsible thing would be for a developer to come on the board and say its dead or its not dead. 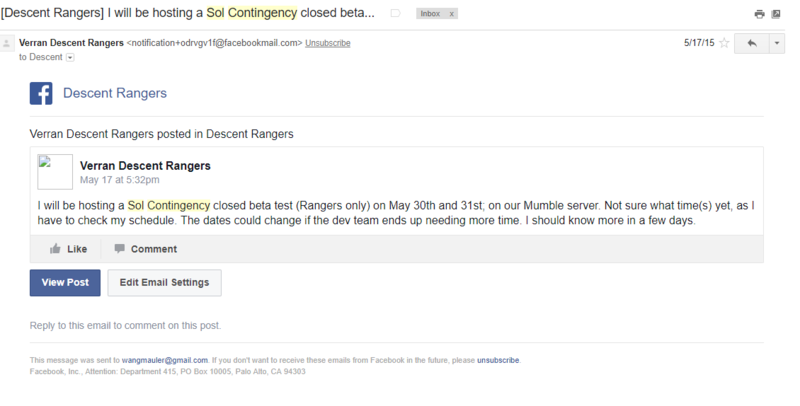 I know that after their release of PG, they only had a few updates for closed beta testing, not really posted on this site, but through the Verran Descent Rangers Facebook group(which I'm part of). Here are the email notifications (mid May and Late May 2017) about their posts/video(which have since been taken down....not a good sign...). I did not get to watch the Twitch stream, and I remember looking for it the day after and not seeing it on the site. I agree though, PG was some of the best multi 6DoF fun I've had in a LONG time. I'd be up for some matches in the coming weeks? Actually it looks like those posts are from 2015, before PG was released. I'm sad that the project isn't moving forward but I'd also love to get back into PG again once my arm has recovered from an injury. Some time soon we should see if we can get people back together to play!